There are many types of personal injury law, one of them being personal injury medical malpractice cases. Other types of personal injury law cases include product liability, premise liability, dog bites, trucking accidents and car accidents. But there are certain characteristics about medical malpractice law that makes it different from other types of personal injury law. Both personal injury law and medical malpractice law deal with bodily harm to an individual. 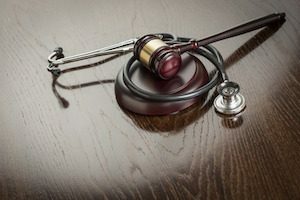 What makes medical malpractice law unique is that the person responsible is a professional. This means they have a different standard of care than the average individual. For example, a doctor who fails to diagnose a patient has likely made a mistake. To determine if there was a mistake for which the doctor is legally liable, the law will see if other doctors in similar situations would have correctly diagnosed the patient. The law compares the defendant doctor to other physicians, not non-doctors. After all, you wouldn’t expect some average Joe down the street to diagnose a patient with liver cancer, but you would expect a cancer doctor to be able to do that. This illustrates the difference in standard of care between a professional, such as a licensed medical doctor, and a non-professional, such as your average Joe. In many personal injury lawsuits, professionals are not involved. A car accident between non-commercial drivers is a typical example. For a judge or jury to figure out who is legally liable for the car accident, a professional witness is sometimes needed, but often they are not. But in a medical malpractice case, you need a medical professional to serve as a witness to explain a mistake occurred. This is because the legal issues are very complex and not easily known or understood by a non-professional. For example, almost anyone can understand that you shouldn’t run a stop sign. But it usually takes a doctor to explain why a particular medical mistake, such as a misdiagnosis or surgical error, should result in the legal liability of the defendant doctor. In a medical malpractice lawsuit, a professional witness is a requirement. Medical malpractice lawsuits almost always involve severe injuries, often severe enough to result in death or permanent disfigurement. As a result, there’s usually a lot of money at stake. With so much money on the line, along with plaintiffs who will never be the same as a result of their injuries, medical malpractice lawsuits are often very hard fought. Non-medical malpractice personal injury lawsuits can also involve severe injuries and a significant amount of damages, but often the injuries are minor and less permanent, so there’s less money at issue. Regardless of whether you’re likely to have a personal injury medical malpractice lawsuit or a more minor run-of-the-mill personal injury lawsuit, your case is important, and you deserve compensation for the harm inflicted upon you. Therefore, you should consider contacting our team at Williams & Williams, LLC online to learn what your legal options may be.